I have a solo exhibition for preSENSE with the Young Gallery, Market Square, Salisbury, Saturday 9th May 2015 (opening 2 – 4pm) until June 13th called WONDERMENT – walklines. I am a hunter/gatherer of people, stories, place, memories and objects. I call these my ‘finders/keepers’. My residency for preSENSE is called Glimpse. 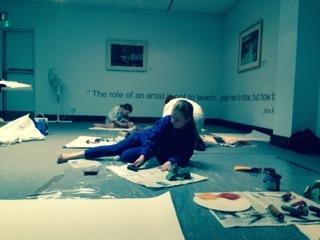 I have been working with the John Creasey Museum, which is part of The Young Gallery Collection. Creasey was a crime writer, art collector and traveller with wide interests…hugely ahead of his time, championing a 3 party political representation for which he put aside his writing and canvassing tirelessly to seed community support. The Guardian newspaper shared his 200 plus images held at The British Library…and I began to know the man. 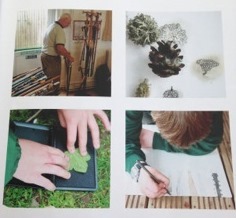 My adventure began at the September 2013 Discovery Day, where artists were invited to come and see some of the Young Gallery Collection…to unlock a creative link and develop a proposal for the preSENSE residency. I chose to use John Creasey’s walking stick collection. I found a wonderful picture of John Creasey skipping in the hallway of what is now New Hall Hospital, near Salisbury and it illustrates his great sense of fun! I had an overriding desire to work with objects that could be handled, to walk, connect, seed projects in the community. 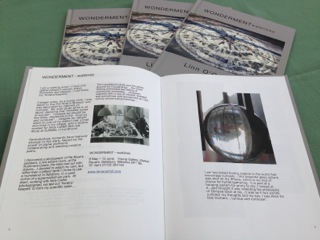 These ‘wonder’ moments (which I spotted at on my interview day) are archived, presented in a library index cabinet and included in my exhibition. It houses captured sounds from workshops and my ‘happy accident’ meetings – farmers, landowners, ordinary village people, a local stick maker, hospital staff, The Friday Café at Lover and local school children – all responses have been archived, offering reflections on the found, the small, and their sense of wonder. Connections and serendipitous moments on this residency have been endless. The project has embedded and forged partnerships and networks – all harnessing social media/digital platforms for my research/practice in the future. I met a man whose mother worked as Alice Liddell’s maid and he shared letters of employment, references and a dress she gave to his mother. ‘She’ is the Alice of Lewis Carroll’s “Alice in Wonderland”. My website comments about the importance of curiosity in life and its relationship to our health/wellbeing and how we should all try and ‘capture a childlike sense of wonder’ and be like Alice…that is what makes this discourse and methodology so exciting and inspirational for myself and others who are part of this creative journey. In the last year, I have been convinced of the power and benefits of exploring and harnessing Twitter/Facebook and other digital platforms to connect with audiences, artists and organisations to capture and embed serendipitous moments and haptic discovery. 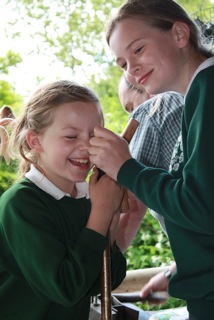 Haptic exploration (the ability to touch objects) was first sparked from my first visit to the Pitt Rivers Museum in Oxford at 9 years, and was awoken over thirty years later when managing a creativity department for young people with ASD/Aspergers/dyslexia. It was through their ways of knowing and sharing their experience of how they took a curve ball approach to finding a way into education/social communication, adapting…seeing these ‘other creative in-roads’ in their discussions, moments and shared experiences that opened up paths that were dormant and needed reawakening…Creasey’s sticks were the conduit for this. During this residency, I was introduced to the work of Jon Adams geologist and artist. His work is included in the Young Gallery collection. The moment I first glimpsed the work was a moment of huge revelation. Jon mapped the walking landscape of mining areas in Cornwall through 3D specific haptic mapping…one which invited the viewer to touch the work – inspirational work. Jon’s perceptive creative inquiry is born out of his unique view of the world. He is dyslexic, has asperser’s and is synesthetic. He is a tour de force and has worked on cutting edge arts residencies, with high calibre organisations, in partnership with Simon Baron Cohen, The Wellcome Trust and more recently, a digital platform called Democracy Street with Parliament. I discovered an image of a billiard table from Pitt Rivers’ home on the Rushmore Estate. 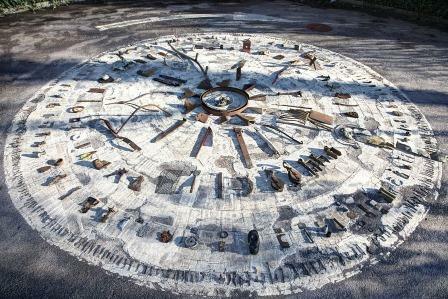 It is covered with found objects; this is a scientific table. I have used this image as inspiration and redefined my ‘finders/keepers’ by placing them on a found space in Salisbury…one in the urban landscape. Nick Carter and I connected on Twitter, Nick is a professional photographer who shoots beautiful images for interior magazines and understands the beauty in placing objects. He has kindly helped me capture this important image for my exhibition. 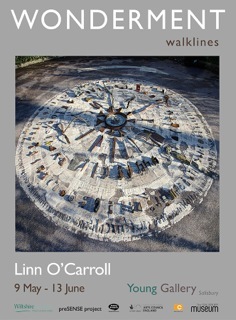 Linn’s exhibition on Wonderment is a fascinating exploration of the amazing and adaptable way the human mind can use different paths to asses ,understand and express information in many diverse ways. Just because a persons perception is different to yours should not be regarded as a weakness but quite the opposite -human’s strength is in the diversity of the mind to understand and make sense of information in a unique pathway to each individual ‘s way to achieve it. I look forward to visiting and seeing the exhibition – sounds fascinating. did you manage to get along and see it Meril? My installation was constructed from old floor tiles from Salisbury Library, it was important I used materials from the same building as the Young Gallery as PLACE is integral in my work. I could not physically move the roundabout I had chosen in Salisbury, but I could adapt my idea. I spent hours looking for a solution and the library is below the Young Gallery. In my garden at Redlynch, Wiltshire, (the place where walks began) I lay out the tiles, using the glued sides, as these resembled the surface of the original roundabout. I mixed ground down chalk gathered from my drover trail walks with gesso and painted the surface and cut a circle. I was mapping my experience, it was quite physical work, but the ritual involved was uplifting, I felt it was very beautiful as at some point many people had walked on these tiles before in the library. 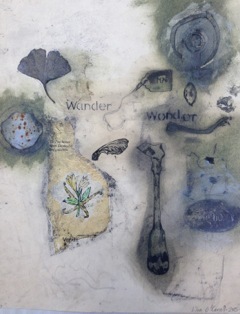 This notion of who has walked the drover trails before me, is a constant in my work as walking artist. Laying the ground, is a hugely important part of my practice both in preparing canvas/surfaces for painting, drawing, printmaking and installations. It also refers to my research and slow time needed for seeding and rooting education work/residencies/projects…my continuing fascination of how we can all embed creativity in our lives, creating a place for it. I have always seen my work as reciprocal and workshops where I can invite a partner organisation, audiences, communities to engage on their terms is fundamental to why I make art. During the Momentum – walking exhibition I will be delivering a drawing workshop called ‘Laying the Ground’ please contact the museum if you would like to take part. Artists will be talking about their approaches to how they use walking, collaboration and connecting at the opening. We are inviting visitors for an afternoon tea/cake informal chat, followed by drinks in the evening. Please contact me via my website if you would like to know more. Thank you, we hope you can join us.